We’re breaking new boundaries today! We’re covering new territory! We’re broadening our horizons! And we’re using an obnoxious amount of exclamation points! But not just any okra! Purple okra. Which, okay you can just ignore that because it’s the exact same as green okra. It totally turns green when you cook it. Like, it’s no different at all. But you know what? Purple okra makes me feel cheeky and THAT IS OKAY. Or is it red okra? Soooo. I . . . never fry things. I guess I should say hardly ever. All that oil in a deep pan, spittering and spattering and sputtering, teeeeeeerrifying. 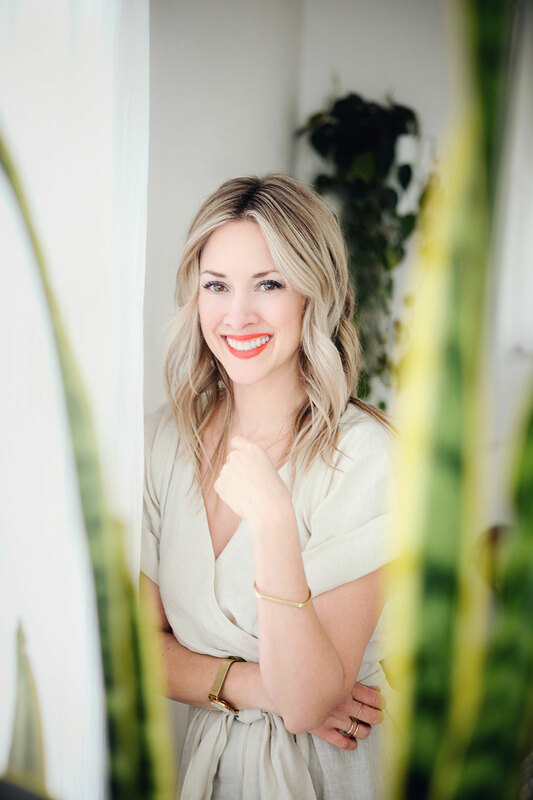 Okay where this comes from; most anytime we go visit my parental units in Arkansas, mom has a huge basket of freshly fried okra waiting for us (and fritos and a can of bean dip – b.e.s.t.s.n.a.c.k.e.v.e.r. 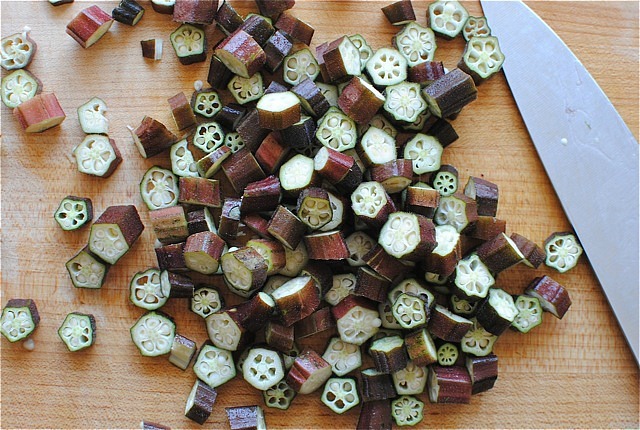 ), and without fail, every single time, Aaron goes completely berzerk on the okra. It’s like watching the end of the Hunger Games. You cannot look away. And last weekend when we spotted this purpleredorwhatever okra at the farmers’ market, it was like, all of the one lightbulb in my head went off. And I knew my time had arrived. And it’s not that hard at all! Little soaky mcsoakerton in some buttermilk, little tossy mctosserton with some flour and cornmeal, little fry-y mcfryerton (you want to stab me right now) in some donkey-hot oil. Here’s the PRE-FRY photo. 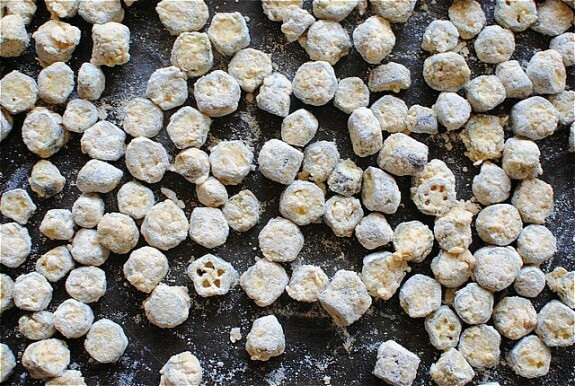 I got better at getting the FEEL of tossing them with the flour mixture the more I did it. It’s like your fingers do a little “jazz hands” motion as the excess coating falls through them, making them evenly and perfectly coated little okra babies. Ready to meet their doomsday. That was out loud, wasn’t it? Post-fry! Would ya just look at that. I didn’t get a picture of the actual frying because my camera was covered in sweat and tears and oh look at that I’m late for therapy. These are so good. Let me tell you something. Once they’re all good and fried and you have them in a single layer on some paper towels draining a smidge, give them another good sprinkling of salt. And a nice squeeze of fresh lemon or lime juice, because you just can’t even take it anymore. 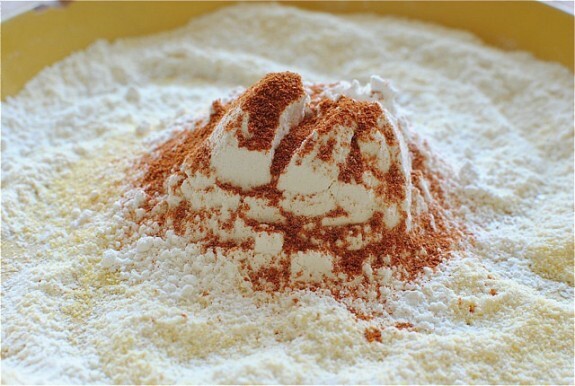 In a shallow bowl, mix together the flour, corn meal, cayenne, salt and pepper. 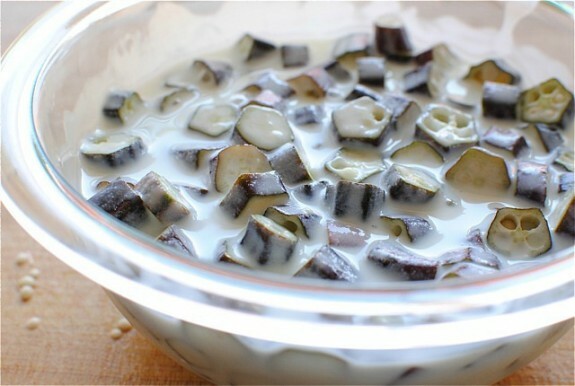 Pour the buttermilk into a bowl and add the okra, stirring to coat. Now, with a slotted spoon, remove the okra in small batches and toss into the corn/flour mixture. Toss around with your hands, letting the excess flour fall through your fingers. Arrange in a single layer on a baking sheet. Continue with the rest of the okra. Heat the oil until it’s like, really hot. You can stick a little wooden stick in the oil, and if it sizzles, you’re ready. It’s ready. WE ARE READY. Again, in small batches, spoon over a few okras at the time into the hot oil (I used a large spoon because every time I tossed an okra into the oil, it would splatter me and I would cry) and fry until golden brown. This will seeeeriously not take long. Like 10 seconds. AND, the further into the frying you get, the less time it takes. SCIENCE. Once they’re good and fried, arrange in a single layer on some paper towels so they can drain. Give them one last good salting, and serve in a basket or whatever with some fresh lemon juice and your favorite dipping sauce! Or eat them as is. They're like little okra nuggets! I want a whole batch for dinner...for myself. Totally normal. Epic!!! They're so beautiful!! I want some!! Right? Why is it purple?!?! it just turns green. SOOO disappointing. These looks awesome! 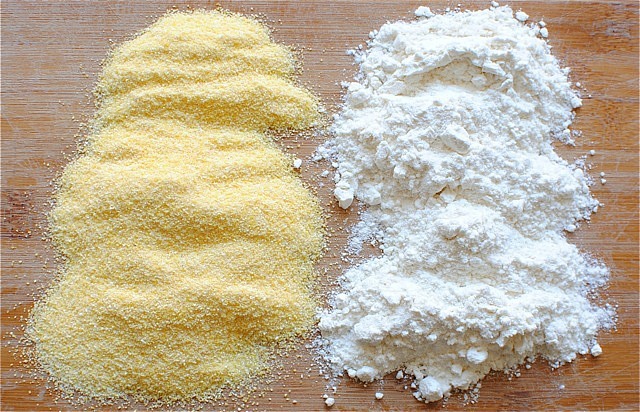 I have such an affinity for the crunch of cornmeal crusts I could pop those little nuggets in my salivating mouth all day. Love it! You know, here in the Blue Ridge Mountains we don't just say ya'll. We say "You'ins" as well. It's crazy talk! 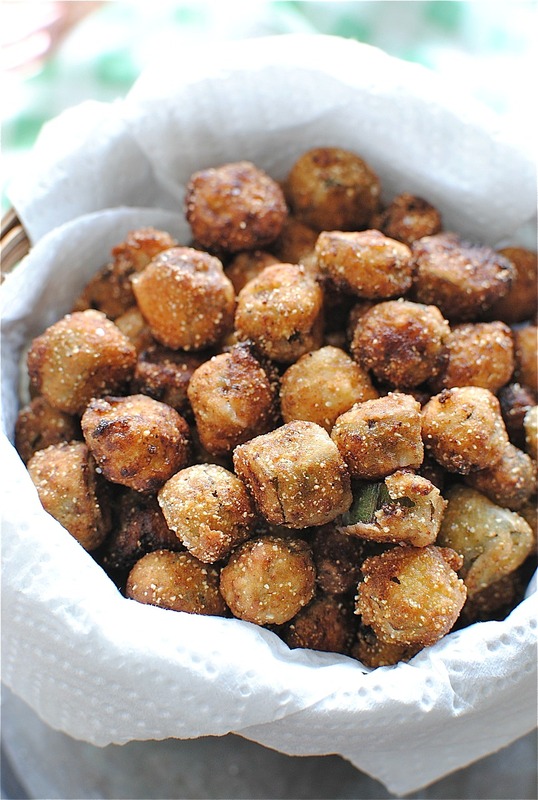 Fried okra is the only way. I'm alllll over this. I seldom eat okra....guess I'm afraid of the slimy texture? But your fried ones looks so tempting. :) Guess this is the best way for me to enjoy them. hehe.. I've only had once before and not the best experience...yours looks like it would be so good fried like that!! I couldn't wait for this post!!! Yessss ma'am I'd like me sum-dem-der fried okras! Dang does this okra look good. Love the buttermilk, love the corn meal, love the cayenne. The slammin south has risen, indeed. Ive never made okra like this and wow, where have I been! Looks awesome Bev! Fried is the only way I enjoy eating okra! Yum! ohmigosh, gimme. i LOOOOOOOVE okra! I loooove it when you fry things! I've never had okra before but you have me so excited to try it out! Welp, the second I spot some okra in California, I am officially making this! Buuuut my boyfriend is going to do the frying. My non-scalded skin is precious mmkay? 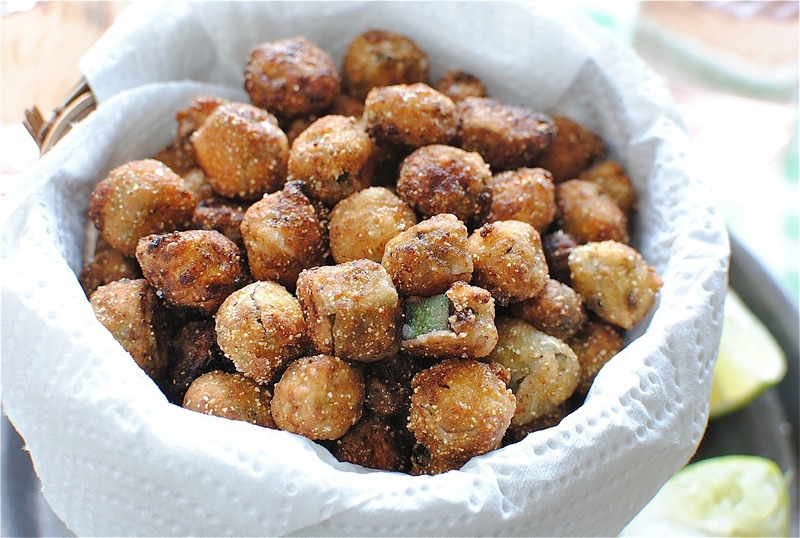 Bev, these are some FUN little okra nibbles! 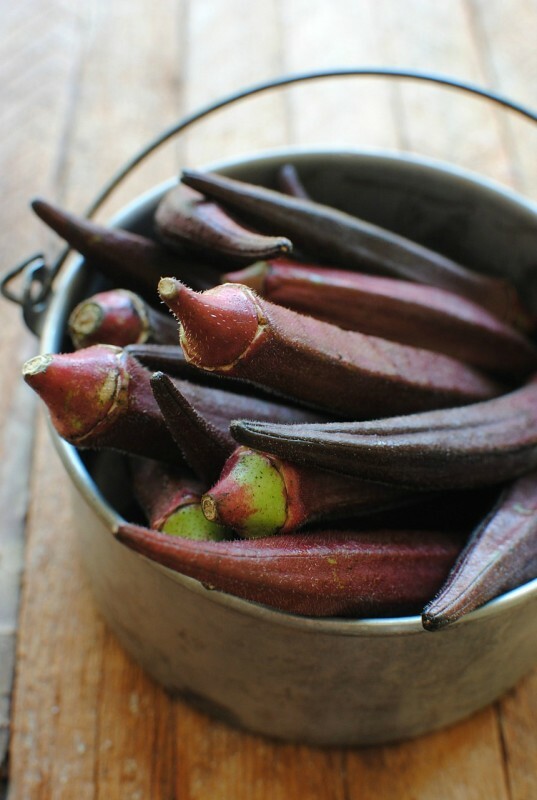 This purplish-reddish okra is so pretty...and I just love fried anything! This would be the only way you would get me to try okra - it scares me! Now this could convert some okra haters in my family. YUM!!! SO okra has always scared me. Mainly because it's called okra...which sounds like a gag noise, but also because I live a sheltered green-beans-only kinda vegetable existence. But I am thinking I will trust you and try this. Because any vegetable that has hypercolor, I sorta need. I've never cooked with okra before... But I'm pretty sure you just convinced me I NEED TO!!!! how innovative is that! great recipe. If you put a little salt in your oil it won't pop!! Try slicing the okra in half lengthwise - that's how my Italian grandma did it and it was delicious. Salt! Get out. I'm totally trying that next time! Ayyeeeee!!! Okra is OK with me! Loveeee it!! 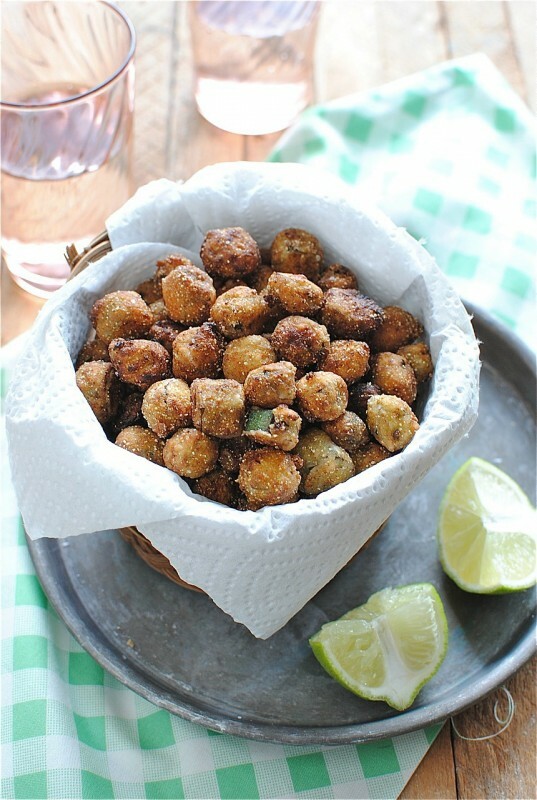 I made this recipe today and it too great for appetizer! Thanks! I love me some okra!!!!!!!!! !....Born in the south, it was a staple in our house....and I laughed out loud at your "tossy mctosserton"...we do that at our house, too...our dogs are Barky McBarkytons....or, in the toy Chihuahua's case, Whiny McWhinerton...LOL...it was a treat to see someone else do it!!! Okra and butter rule!!! Bev, you did good. Cajun Purple fried okra fried. Never had purple okra before. Never seen purple okra before, but some delicious Cajun style. Love red okra, love green okra; both in my CA mountain garden. Also loved your really cute way of writing. Can't wait to try your seasonings, as otherwise, I make it the same way!!!!! Keep on cookin' Girl (more exclamation marks, can't have toooo many!!!!! seconds? 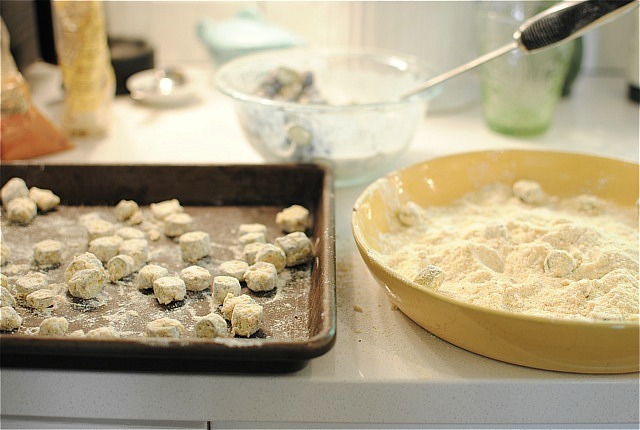 It takes more than a few seconds to fry okra so that the okra is cooked, not just the coating.